We’ve taken a close look at Weruva and graded it according to the We’re All About Cats standard, evaluating the brand on species-appropriateness, product variety, price, ingredient quality, customer experience, and recall history. We’ve analyzed Weruva cat food and graded it according to the We’re All About Cats standard, evaluating the brand on species-appropriateness, ingredient quality, product variety, price, customer experience, and recall history. Here’s how it rates in each of these six key areas. In total, we give Weruva cat food a 41 out of 60 rating or an B- grade. Weruva offers a variety of wet cat foods that highlight species-appropriate animal protein with minimal plant ingredients. It scores well in species-appropriateness and ingredient quality, but its high price and recent involvement in a serious recall may be cause for concern. 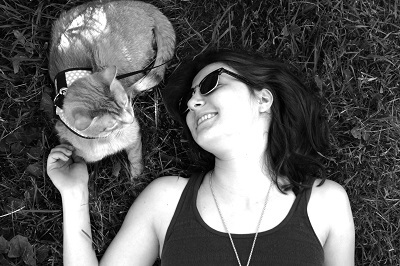 Continue reading to learn more about Weruva and whether or not it’s a good choice for your cat. Weruva was founded in 2006 by David and Stacie Forman. The company’s name is derived from the names of David and Stacie’s three cats, Webster, Rudi, and Vanessa. Weruva specializes in high-moisture foods made with simple animal ingredients and relatively low plant content. All of their foods are free from artificial ingredients, meat by-products, and carrageenan. Weruva partners with a pet and human food processing facility located in Thailand.The facility has earned an “A” designation from the British Retail Consortium (BRC) standard for human consumption. The brand uses chicken and duck sourced near the Thai manufacturing facility, beef and lamb from Australia and New Zealand, and turkey from the United States. Their seafood ingredients are sourced from the Pacific Ocean. Has Weruva cat food been recalled? Weruva cat food has never been recalled, but the company’s B.F.F. brand was recalled in 2017 due to low thiamine levels. Insufficient levels of Vitamin B1 (thiamine) were linked to hundreds of cases of illness and several deaths. The recall involved an Australia-exclusive product line only. The affected products were manufactured in a single facility that doesn’t handle any other Weruva products. What kinds of cat food does Weruva offer? Weruva describes their foods as “fit for human consumption”, “fit for humans”, and specifies that their products are made in “human food facilities”, but steers clear of the “human grade” label. Their foods are primarily made from meat with minimal fruits and vegetables. Weruva doesn’t offer any dry foods. All of their foods are moisture-rich and available in pouches or cans. 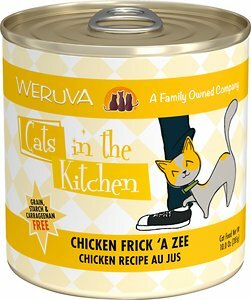 Weruva’s Classic Cat food includes five chicken and seven fish-based recipes. All of them are flaked or finely chopped foods with a meaty texture. The company explains that these recipes contain the same ingredients used in their Weruva cat recipes, but with a pureed texture for cats who prefer something smoother. The patés are available in six canned flavors and eight flavors in pouches. Weruva Cat Stews are extra-juicy with chunks or shreds of meat, including chicken, turkey, and beef. There are six stews in pouches and six in cans. Cats in the Kitchen Originals are inspired by home-cooked family meals, with recipe names like Lamb Burger-ini and Chicken Frick ‘A Zee. These foods feature shreds, flakes, and chunks your cat can bite into. Ten of these recipes are packaged in cans and six of them come in pouches. 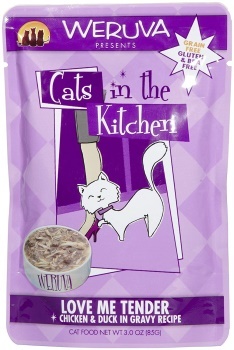 Weruva’s Cats in the Kitchen paté foods are packaged in single-serving pouches. All six paté recipes are named after 1980s hit movies, with titles like Meowiss Bueller and Cattyshack. Truluxe is described as “premium nutrition for the most discriminating pets” and contains expensive meats not found in other Weruva products. There are ten canned foods in this line. Recipes include Peking Chicken, On the Cat Wok, and Meow Me a River with Basa in Gravy. This food features boneless, skinless chicken breast as the primary ingredient. The shredded meat is set in chicken broth thickened with potato starch and xanthan gum. Sunflower seed oil is used as the primary fat source. An animal fat would be preferable. Overall, this is a meat-based cat food with high protein content, low fat, and high carbohydrate content relative to other canned foods. 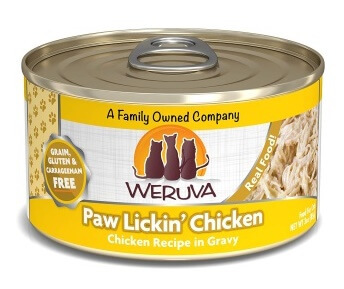 Weruva Paw Lickin’ Chicken is 85% water, which means that it’s lower in calories than less moisture-rich foods. Each 5.5 oz can contains 105 calories or 19 calories per ounce. Chicken (Boneless, Skinless Breast), Chicken Broth, Potato Starch, Sunflower Seed Oil, Calcium Lactate, Xanthan Gum, Tricalcium Phosphate, Choline Chloride, Taurine, Zinc Sulfate, Vitamin E Supplement, Ferrous Sulfate, Nicotinic Acid (Vitamin B3), Thiamine Mononitrate (Vitamin B1), Calcium Pantothenate, Copper Sulfate, Riboflavin Supplement (Vitamin B2), Pyridoxine Hydrochloride (Vitamin B6), Vitamin A Supplement, Manganese Sulfate, Vitamin D3 Supplement, Folic Acid, Potassium Iodide, Sodium Selenite, Biotin, Vitamin B12 Supplement. Chicken, tuna, and duck appear to be the primary protein sources in this wet cat food. This food is made primarily from boneless, skinless chicken breast, tuna, and duck. The meat ingredients are shredded and set in a thick broth made with tapioca starch, sunflower seed oil, xanthan gum, and all the vitamins, minerals, and amino acids cats require. Overall, this meat-based food is exceptionally high in protein, low in fat, and, thanks to the presence of starches and thickeners, relatively high in carbohydrate content. This is a low-calorie food with 64 calories per 3 oz pouch or about 21 calories per ounce. Since the average cat requires around 200 calories per day, you might need to feed your cat three pouches or more daily. This adds up to a lot of tearing, pouring, and money spent. This is a simple chicken-based food with shredded chicken set in a sauce made from chicken broth and thickeners. To thicken and bind the food, the recipe contains multiple gums. Locust bean gum, xanthan gum, and guar gum all make an appearance on the ingredient list. Unlike most other Weruva foods, this recipe contains fish oil in addition to sunflower seed oil. It’s good to see animal-sourced fats in cat food. The ingredient list wraps up with vitamins, minerals, and amino acids that make the food nutritionally complete. Overall, this is a meat-based food with high protein content, low fat, and low carbohydrate content. Like most Weruva foods, it’s a low-calorie food with 143 calories per 6-oz can or about 24 calories per ounce. Chicken Broth, Chicken, Sunflower Seed Oil, Calcium Lactate, Locust Bean Gum, Tricalcium Phosphate, Xanthan Gum, Fish Oil, Guar Gum, Potassium Chloride, Choline Chloride, Taurine, Zinc Sulfate, Vitamin E Supplement, Nicotinic Acid (Vitamin B3), Ferrous Sulfate, Thiamine Mononitrate (Vitamin B1), Calcium Pantothenate, Vitamin A Supplement, Manganese Sulfate, Copper Sulfate, Riboflavin Supplement (Vitamin B2), Pyridoxine Hydrochloride (Vitamin B6), Vitamin D3 Supplement, Folic Acid, Potassium Iodide, Sodium Selenite, Biotin, Vitamin B12 Supplement. What do customers think of Weruva cat food? Weruva is a well-respected cat food brand that receives primarily positive reviews on product listings and in online discussions. To get an idea of what real customers are saying about Weruva, here are a few reviews selected from several popular recipes listed on Amazon and Chewy. How much does Weruva cat food cost? According to Weruva’s feeding instructions of one ounce per pound of bodyweight daily, most of their foods will cost between $3.10 and $3.90 per day to feed the average 10-lb cat. Foods from the super-premium Truluxe line will cost more at around $5.50 per day. Overall, is Weruva a good choice? If you’re looking for a high-moisture food made primarily from meat with minimal plant content, Weruva might be a good choice. Many of their products are virtually plant-free and low in carbohydrates, making them species-appropriate for your obligate carnivore. On the negative side, their foods are expensive and low in calories, meaning that they cost over $3 and up to $5.50 or more per day. Many of their recipes contain starches and thickeners, bringing the carbohydrate content up to around 20% on a dry matter basis. Where is Weruva cat food sold? Weruva sold by the “finest specialty pet retailers across the world.” It’s sold in stores around the United States, Canada, Australia, Kuwait, and South Africa. Click here to find a retailer near you. You can order it online through Chewy, Amazon, and Petco.com. 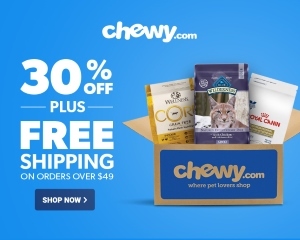 Click here to shop for Weruva cat food on Chewy.